If we accept the Quantum mechanical idea of the vacuum creation of Lepton pairs around a black holes, then only a minimal amount of (anti-)Leptons is supposed to be annihilated in the Comet case. This is possible if the vacuum Higgs lattice has a chiral structure in combination with an opposite chirality for Leptons and Fermions! As a result “left handed” chiral Positrons tend to "absorb" easier and more Gluons/Photons than Electrons do inside a “left handed” chiral vacuum. Positrons seem to be able to form positive Quarks by "click-on" Gluon/Photon absorption. This "click-on" system facilitate Electrons to form negative charged Quarks. This simple principle solves even the well known Big Bang anti-matter annihilation problem! As a result, COMETS are spongy icy H2 balls created around micro black holes by the Quark Gluon plasma producing Black Hole horizon. To understand Micro black hole (MBH) characteristics we seem to need a new Hawking radiation model. 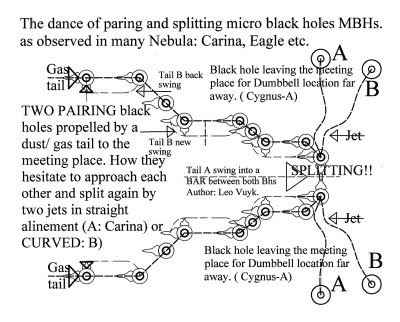 According to this model, Micro black holes are supposed to show up as Ball lightning, Comets and Herbig Haro objects. 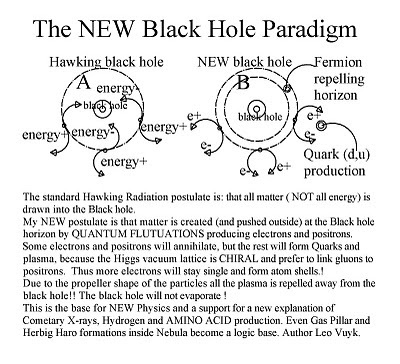 The NEW Hawking radiation presented here, goes back to 1973. Soviet scientists Yakov Zeldovich and Alexander Starobinsky showed Hawking in 1973, that according to the quantum mechanical uncertainty principle, rotating black holes should create and emit particles. 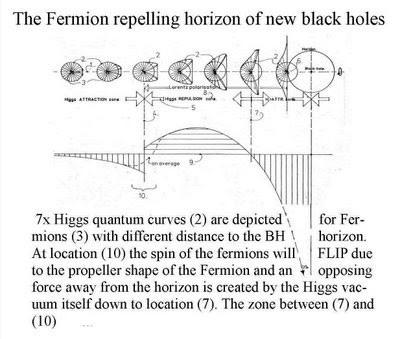 My interpretation of the Higgs vacuum is that Black holes don't need rotation to repell all particles created by vacuum fluctuations due to their propeller structure and are even able to form QUARKS BY A NEW STANDARD MODEL of "click-on"photons/Gluons. Conclusion both QUARKS ( d and u) are created all together with electrons and positrons. Hydroxyl (OH), Hydrogen and even complete water molecules seem to be possible as is found in Comets. 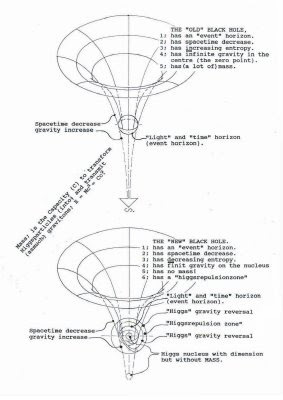 This production of water by the micro black hole is supposed to be the real compensation for the continuous loss of water molecules by Comets. Conclusion: Comets harbour micro black holes in their nuclei. X-ray and even annihilation radiation effects are also a logic result of Comets. However, no annihilation radiation is found related to Comets untill now.